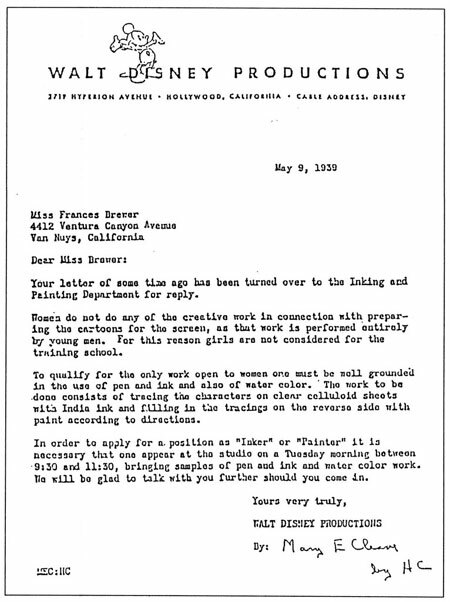 This letter from Walt Disney Studios illustrates the great difficulty women animators have faced in obtaining, maintaining, and furthering their positions in the industry. A drawing by animator Reiko Okuyama. I was lucky enough to learn about some amazing women animators as a Classical Animation student at Sheridan College, when their short films were shown and discussed in class. In turn, I introduced my computer animation students at Pratt, School of Visual Arts (SVA), and CU Boulder, to their innovative techniques, unforgettable story lines, and indelible styles. These pioneer women animators live on the pages of animation history. Each of these women animators has left a great legacy of animated shorts, animated feature films, and beloved cartoon characters. Each one of these women has influenced numerous animators and artists. Many have taught animation, painting, drawing, and other skills to students and the public. Some have raised families, worked their way up the male-dominated world of film and television studios, and almost all have worn the numerous hats it can take to master such a complex art form as animation. These women are pioneers in the field and in their gender, breaking new ground in the face of sometimes daunting obstacles. Their challenges and struggles are impressive, their courage and creativity dazzling. Caroline Leaf animating in sand on a light box. In this list are only ten of the many pioneer women animators who lead the way on how to survive, thrive, and live on the pages of animation history. I have listed them in order of their birth year, when known (else, I approximated). 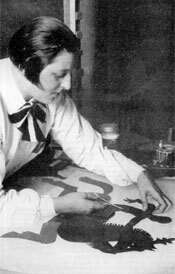 Lotte Reiniger animating a silhouette puppet. “The Adventures of Prince Achmed” (1926), one of the first animated feature films in cinema history. A still from Lillian Friedman's animation of Popeye and Olive Oil. Acknowledged as the first woman animator within the studio system, Lillian Friedman drew into life the characters Popeye and Betty Boop, among others. After working her way up the ranks from Colorist/Inbetweener/Inker and Assistant Animator, Lillian made film history when she was promoted to Head Animator at Fleischer Studios in 1933. She was also the Head of Inbetween Department at Fleischer, and animated 11 titles for the studio between 1933-1939. Eunice Macaulay began her animation career when a Christmas card she created for fun landed her a job as a Tracer in Gaumont British Animation in 1948. In her career, she worked on a total of twenty-five short films and received numerous awards, including an Oscar. In the field of animation, she worked as a Director, Producer, Rendering Supervisor, Writer, Background Artist, Coloring Supervisor, Trace and Paint Supervisor, and Animator. Her technique involves drawing and hand-coloring. Faith Hubley with her husband John (left) with jazz musician Benny Carter. Faith Hubley grew up in Hell’s Kitchen, New York City, and made her way to Hollywood at the age of eighteen. She worked her way up the system as a messenger, sound effects and music editor, script clerk, script supervisor, and film editor. 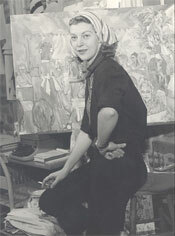 Her techniques involved drawing and painting and resembled European surrealism and impressionism. From 1956-1977, Faith and her husband created one animated film each year, a tradition she continued for twenty-five solo films after his death. In all, Faith won Oscars for two of her films and was nominated for another three, and has been honored at Cannes, London, Venice, and San Francisco film festivals. After animating at Walt Disney, Elizabeth Case went on to painting and illustration. One of the first and few women animators/artists in the very early days at Disney, Elizabeth Case Zwicker was hired in 1956 as a fine artist. She animated birds in “Sleeping Beauty” for $32-$35 a week, but didn’t care about the money because she loved animating. She drew and painted most of her life, illustrating children’s books and painting a mural at a public library in New Jersey. In addition to art and animation, Elizabeth taught painting and wrote poetry. She is listed in Who’s Who in American Art. 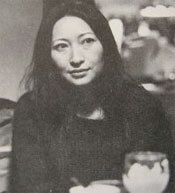 Kazuko Nakamura in the early days of Animé. 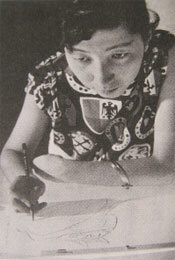 One of the very earliest women in animation in Japan, Kazuko Nakamura was hired as an Inbetweener in 1956 at Nichido studios. Because of her outstanding skills, Mushi Pro studio “stole” Kazuko away, where she worked on their first production in 1962, and later became an Animation Director for their TV series and Head Animator on the first two adult Animerama features. Kazuko is regarded as a powerhouse animator: hardworking, distinctive in animation style and personality, and renowned for the femininity of her characters, especially the title character in “Cleopatra.” Altogether, Kasuko worked on eighteen anime feature films and TV shows. Jacquie Lawson working on a Flash animtion at her computer. Like Eunice Macaulay, Jacquie Lawson got her start in animation with a Christmas card. Trained as an illustrator at St. Martin’s School of Art in London, Jacquie became fascinated with the internet and created her first animation in 2000: a holiday E-card based on her dog, Chudleigh. She became a rapid success and an internet legend with her subscription-based, advertising-free eCard company, Jacquie Lawson E-cards. Her technique involves rotoscoping from live action video, Flash “tween” animation of scanned paintings, and her own digital adaptation of Disney’s multi-plane layers to move through two-dimensional artwork in a manner that feels 3-D. Her unprecedented commercial success puts Jacquie in a category of her own. The pioneer woman animator Caroline Leaf. Caroline Leaf is among the most significant solo women animators in film history. She invented her own frame-by-frame techniques, including sand animation on a light box, painting on glass directly under the camera, and scratching on 70mm film and reshooting it on 35mm. Many of her short animations were done at the National Film Board of Canada, and she has won a great many awards, including an Oscar nomination. In addition to animation, Caroline worked on a number of live action documentary films. She is currently a tutor at the National Film and Television School in London. Animator Joanna Quinn acts the part for an animated character. Joanna Quinn quickly became one of Britain’s noteworthy animators after her first film was shown at her graduation from Middlesex Polytechnic in 1985. She works in a traditional pencil technique. 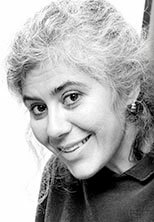 The combination of her expressive drawing style, great sense of humor, and feminist themes has garnered numerous awards in the film world, including an Oscar nomination, as well as commercial spots for television. I would love to add to this list, and my hope is that the work of these outstanding women artists will inspire all those who engage in any technique within the art form of animation. You may be interested to learn more about Soviet animation directors, many of whom were women. Sisters Valentina and Zinaida Brumberg, in particular, were directing animated movies since 1927. Alexandra Snezhko-Blotsaya also deserves a note. Thank you so much for making your research available – I have really enjoyed learning about these women animators and I”m very excited to share their work with my middle school students – great to see the embedded videos. I also followed the link to your current exhibition – looks fantastic – best wishes for your show. Hello–I came upon a painting by Elizabeth Case Zwicker at a thrift store here in Los Angeles. I bought the painting. The painting is signed. I’m wondering if anyone might be interested in the painting–an animation organization or a museum or perhaps Disney. I have photos and will share them with you, if you like. Hi. I’m a big fan of many of the animators that you talk about. I’m a paint-under-the-camera animator, myself, and have recently started a new site for animated ecards at http://www.leimation.com. I hope you will check it out. Thanks! Sally Cruikshank! “Quasi at the Quackadero” is a classic and was inducted into the U.S. National Film Registry. Hello Maggi! Thank you so much for letting me know about Eunice’s passing. My deep condolences to you and your family. I really am so impressed with your Mum’s life work, her great contribution to animation, and how she pioneered the way in a new art form for all people – men and women. Hello Sonya, I just came across your blog and was thrilled to see my mum’s name among your ten women in Animation. We are all so proud of what Eunice accomplished. Unfortunately, she passed away on July 8 of this year just 3 days after her 90th birthday. She would have been very pleased to see that people think so much of what she achieved. Thanks for this great wealth of additional women animators, Pam! Yes, I totally agree and about the Canadians, too. Happy animating and happy watching!! Sally Cruishank- SF bAY AREA Animator- “Face like a Frog” “Don’t go in the Basement” and “Quasi at the Quackedero” – fleischer influenced..
Nina Paley “Sita Sings The Blues” http://www.youtube.com/watch?v=RzTg7YXuy34&feature=player_embedded#! Ther’s also some Eastern European filmmakers that should be on your list and don’t forget the Canadians! Loads more amazing women at the NFB of Canada. Being self taught, I am oblivious to the idea of discrimination against female animators today. I would love to take a class (perhaps tutorial) on the techniques of Caroline Leaf’s sand and light-box method, Lotte Reiniger paper cut outs tech. (such detail in the Hansel and Gretel film! I couldn’t believe she got all of that emotion out of silhouettes! amazing!). All noteworthy and worthwhile practitioners of the art of animation, to be sure, and several women who proudly bear the weight of a milestone in the history of the art form. If further study is of interest to you I would strongly urge you to lok into the career and really exquisite work of the animator Tissa David, truly one of the finest practitioners of Character Animation at work today. Tissa worked for The Hubleys, Jean image, Bob Blechman, Richard Williams, Michael Sporn and others, and has often subsumed any personal style into the requirements of work that was commercial in nature. Her “style,” if it can be called such, is in the performances her characters give, regardless of the graphic approach at work. Her work on the films of Michael Sporn has been transcendent. A fine chapter on her exists by John Canemaker in his book on the making of the feature RAGGEDY ANN & ANDY and I recommend it to anyone interested in this fine artist. Sadly there is far too little else on her available except the work, and I might suggest also checking Sporns Blog Splog for some insight into Tissa as an artist and a human being. In her case the two aspects are inseparable. What wonderful stories! I was especially intrigued by the work of Lotte Reiniger – what an incredible amount of imagination and technical skill is displayed in this early example of animation. Thank you for educating me on this art form. As never before in the creative arts and industries we need to have touchstones for inspiring young women and girls to pursue their dreams and make them manifest for the world to experience and learn from. Gender discrimination is alive and well throughout the workplace in all disciplines. If even one young artist gains enough strength from these stories to continue to pursue their interests, it will be a dazzling success. Thanks, Sonya for putting this compilation together. Anyone that would hire Sonya to do a project would be getting a Gem.